As the dust settles from Donald Trump’s bombshell announcement of the appointment of Judge Neil Gorsuch to the Supreme Court on Tuesday night, a divided American political landscape has emerged once again. Democrats and leftist groups are quite literally losing it over Trump’s actions as president. They cry, scream, yell, protest, boycott, threaten and vow to “resist.” It’s almost gotten to the point where we have to wonder how much worse their behavior can possibly get. These are desperate measures from a desperate group of people. Democrats have to know in their hearts that what they’re attempting to accomplish is doomed from the start. And their rancor is incredibly harmful to the country as a whole because if you’re a conservative and speak out in favor of something Trump has done then the other side immediately brands you with the politically correct “deplorables” set of labels. The Democrats can’t decide who they are so they start trying to define everyone else. Conservatives shouldn’t forget it was only a year ago that the Republican Party was going through its own identity crisis. Yesterday marked the one-year anniversary of the Iowa caucuses. Ted Cruz won, Trump came in second and Marco Rubio took third. It looked like the world turned upside down as Trump vowed to fight on until the end. The problem many conservatives (myself included) had with Trump during the primaries was a disbelief or fear that this brash-talking, super-wealthy reality TV star whose personality seemed larger than life would actually carry through on all the spectacular things he was promising. Build a wall? Ban immigration from terrorist hotspots? Cancel long-standing trade agreements? Force companies to keep jobs in America? Appoint originalists to the Supreme Court? Build pipelines? There was no real grounding in limited-government thinking with Trump but still the ideas resonated with many conservatives. And besides, Trump didn’t care in the slightest about being politically correct. There was no play to Muslims or other particular ethnicities and no attempt to bribe a class of people to back him. But if he wasn’t steeped in ideology, how could Trump be trusted to keep his word? From a philosophical standpoint, if he didn’t understand the positions he was taking and he was saying these things only to get people riled up, how could he make sure they were implemented? We all know now that characterization was a lie. Trump understands the issues down to the last dotted “i” or crossed “t”. The left is fond of perpetuating the ruse that Trump isn’t ideological. It’s become clear through his actions since being sworn-in that Trump very much believes in what he’s doing. He may not appear to be a “big picture” guy but he’s making lots of small moves to achieve the end goal: Make America Great Again. Liberals fear Trump because the president can’t be deterred by all the usual political weapons they’ve utilized in the past to scare Republicans into folding. They organize mass demonstrations; they play up to their willing accomplices in the mainstream media; they engage in dirty procedural tricks in Congress and they threaten civil unrest should Trump carry out his intentions. None of it has stopped Trump one bit. In fact, the more he’s attacked the stronger he appears to get. With Mike Pence at his side and Kellyanne Conway and Steve Bannon funneling him advice and encouragement from a conservative perspective, President Trump knows he has everything he needs to follow through on his promises to the people who voted for him. Heck, even consummate Republican establishmentarians Reince Priebus, Mitch McConnell and Paul Ryan appear to be converts to the cause. I’ve never seen such Republican unity and resolve. It’s strange how it took a man from completely outside the system to bring a collection of folks together who are supposed to be on the same team to “play” as one. It’s almost like the Whoopi Goldberg character in “Sister Act,” the story about a morals-challenged lounge singer hiding out in a convent who teaches the nuns in the choir how to sing together. The liberals in Hollywood, including wacko Goldberg herself, would hate the comparison -- but it works. Quite simply put, after all these years Republicans appear to have finally learned how to “sing” together. And it’s Trump who is now preaching to the choir. The Democrats don’t seem to be hearing the harmony, however. 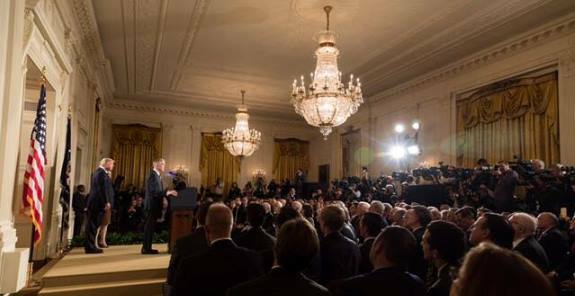 Tuesday night’s ceremony announcing the appointment of Judge Gorsuch to the Supreme Court was just the latest demonstration of Donald Trump’s mastery of message and media. Instead of putting on a relatively low-key, lightly attended event in the Oval Office during the morning hours Trump decided to move the occasion to primetime when the network news teams would be forced to stay around and break into their regular programming to cover it. It was almost akin to the NFL taking its headlining game every week and putting it on Sunday night football. Even the media seems grudgingly impressed by the news “productions” coming from the White House. In viewing Trump’s “performances” in the White House I can’t help but think back to the days of Ronald Reagan’s presidency. As the “great communicator,” Reagan played the part of the president much better than any disinterested actor ever could on stage. Trump is following suit, giving run-of-the-mill everyday occurrences a little show-biz flair, complete with changing facial expressions and hand gestures. The Gipper was much more formal and rhetorically gifted than Trump is now – call it a different genre of entertainment – but there’s little doubt that everything Trump does publicly is intended to promote his message to the country with a competence and confidence that is reassuring. And perhaps best of all, he makes it interesting and “fun” to watch, too. If that’s a “reality TV show” then renew it for another season. What Republicans have been dismayed? Lindsey Graham and John McCain? Who cares? Considering Trump’s predecessor avoided the media like a plague, there’s not much to disparage when it comes to the new president’s openness and candor. Many in the media for instance, including some in the conservative media, claim Trump botched the rollout of his overseas travel and immigration restrictions last Friday. It didn’t occur to me that anything was wrong with the “production” until people mentioned it. I guess if critics don’t criticize then they’re not really critics. But the American public seems to be taking to Trump’s work. Kaitlan Collins of the Daily Caller reports, “President Donald Trump’s approval rating is on the rise. Here's the direct link to the Politico article with the poll if you'd like to see it. Even the slightly lower Gallup numbers suggest Trump is providing most people something to like if they’re paying attention. I highly doubt a president Hillary Clinton’s approval numbers would be any better, because she would have essentially just continued the unpopular policies of Obama, but with an “I’m a woman!” spin to it. I’d also love to see what the approval ratings are for congressional Democrat leaders. I’d bet they’re terrible. Senator Jeff Sessions was the first of Donald Trump’s cabinet nominees to be questioned before a Senate committee and it’s been over three weeks since he testified. Sessions finally got his vote in the Judiciary Committee on Wednesday and he passed thanks to support from fellow Republicans. Of course Democrats claim Yates was acting “independently” in standing up to Trump on an “unconstitutional” order, whereas Sessions would just carry out Trump’s wishes no matter what. The Democrats will beat every dead horse until the bones are exposed and then they’ll move on to find another dead one to lash. Their political ploys are truly nauseating and made all the more revolting by the fact they’re impugning the character of a man who many of them have served with for decades. As indicated, Sessions looks to be confirmed by the full Senate. Another of Trump’s nominees may not be so fortunate, however, as a couple Republican senators announced they’re pulling their support for Education nominee Betsy DeVos. Al Weaver of the Washington Examiner reports, “Sens. Susan Collins, R-Maine, and Lisa Murkowski, R-Alaska, both said they would vote against her. As two of the most liberal Republicans in the Senate you had to figure Collins and Murkowski would break at some point. So much for the wonderful party “unity” I talked about above. This article from the Alaska Dispatch News indicates Democrat groups have been targeting both Republican senators with a massive call campaign to try and get them to pull support for DeVos. Unfortunately, it appears to have worked. If DeVos’s nomination goes down it could put a damper on the good feelings between Republicans these days, but it’s important to remember that there have only been a few potential defectors (in addition to Collins and Murkowski only John McCain has indicated he may vote no on one of Trump’s appointees) in an otherwise united effort. And none of the wavering Republicans is particularly surprising. There were rumors that State nominee Rex Tillerson may have trouble getting through but McCain, Lindsey Graham and Marco Rubio all voted “yes” on his nomination – and Tillerson was confirmed on Wednesday by a 56-43 vote. With Sessions now certain to get through the most critical pieces of Trump’s administration will survive. I’m guessing DeVos will as well, though she might need Pence’s vote to break a tie. Time will tell.